Overall, many publics are somewhat more satisfied with the state of their countries than they were five years ago. In the 35 nations where trends are available, the number of people satisfied has increased in 21, declined in nine, and remained basically unchanged in five. The greatest improvement is found in Bangladesh, where 75% currently say they are satisfied with the direction of their country, compared with 20% in 2002. Five years ago, only 8% of Kenyans were pleased with the way things were headed; today, 45% say they are satisfied. Other large improvements have taken place in a diverse set of countries: Argentina, India, Slovakia, Jordan, Turkey and China. In some countries, however, assessments have grown more negative. Five years ago, only 24% of Italians said things were going well in their countries, but in the current poll the number is even lower – 16% now are satisfied with the country’s course. Satisfaction has also dropped significantly in Canada, Pakistan, France, the Czech Republic and Uganda. Still, the country where discontent has grown the most is the United States. In 2002, 41% were satisfied with the country’s direction, while today only 25% are satisfied. Democrats (16% satisfied) are particularly displeased, although even among Republicans, just 39% believe things in the country are headed in the right direction. Satisfaction with the state of the country is generally associated with rising economic growth. Countries such as Argentina, Venezuela, Slovakia, India, China and Turkey that have enjoyed large increases in GDP per capita since 2002 also tend to have had the largest gains in country satisfaction. Despite the increased satisfaction in many countries over the last five years, global publics largely remain unhappy with the direction of their countries. 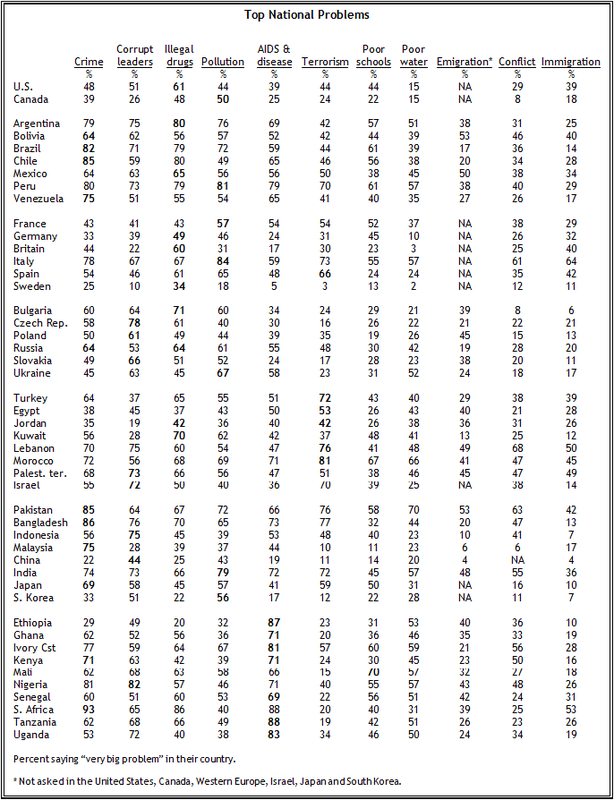 Majorities in only eight of 47 nations say they are satisfied with the way things are going in their countries today. Across the world, however, there are enormous differences. The top three most satisfied publics are all in Asia – China (83%), Malaysia (76%) and Bangladesh (75%). Conversely, in five nations the percentage of people satisfied with the current situation is in single digits – Bulgaria (9%), Ukraine (9%), South Korea (9%), Lebanon (6%) and the Palestinian territories (5%). While the Lebanese and Palestinians are extremely unhappy with the way things are going in their countries, elsewhere in the Middle East assessments are more upbeat. Most Moroccans, Jordanians, and Kuwaitis, along with nearly half of Egyptians, believe their countries are on the right track. In other regions, views are largely negative. No country in Latin America, Eastern Europe, or Africa has a majority that is satisfied with the state of their country. In most countries, people are much more enthusiastic about their economies than about the overall state of their nations. In just over half (24) of the countries included in the study, at least 50% say their country’s economic situation is good. No country is more positive about its economy than oil-rich Kuwait – nearly nine-in-ten (87%) Kuwaitis say their economy is in good shape. In addition, 80% or more in Sweden, China, and Canada also say their countries’ economies are strong. Other publics, however, are less sanguine about their economic situation, especially Palestinians (10% good), Lebanese (9%) and South Koreans (8%). Across all regions of the globe, economic evaluations have improved over the last five years. In 28 of 35 countries where trends are available, the number of people who believe their country’s economy is in good shape has increased significantly since 2002. This positive shift is particularly striking in Latin America. Publics in every country in the region where trends are available have grown more positive about the economy. Only 1% of Argentines felt the economy was strong in 2002, compared to 45% today. In Bolivia, confidence in the economy has more than tripled, jumping from 18% to 58%. The shift has been almost as dramatic in Venezuela (21% in 2002, 57% now), which has benefited from rising oil prices in recent years. Perceptions have also grown more positive in Eastern Europe, although most in the region remain glum about their economic situations. The most impressive turnaround has occurred in Slovakia – 53% give their nation’s economy positive marks, compared with just 7% in 2002. In Western Europe, Italians (-11) and French (-15) give their economies lower marks now than in 2002. Germans (+36), however are much more positive about their country’s economy, despite Germany’s relatively slow economic growth over the last five years. Other nations have also become more upbeat, including India (+35) and China (+30), two emerging Asian economic powers. The Turks (+32) also feel much more positive about their economy than in 2002. And the greatest increase on the survey occurs in Kenya, where positive assessments of the economy have risen a stunning 53 percentage points in the last five years. More generally, economic growth is correlated with more positive assessments of the national economy. Argentina, Venezuela, Slovakia, India, and China are examples of this pattern – all have enjoyed impressive economic growth over the last five years and in each of these countries evaluations of the economy have grown significantly more positive. The problem of political corruption is pervasive across all regions. 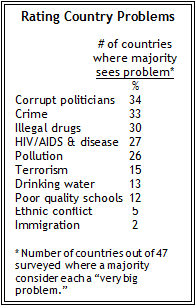 Corrupt political leaders are considered a very big problem by majorities in 34 of 47 countries, although there are substantial variations among countries, ranging from 82% in Nigeria to just 10% in Sweden. Similarly, in regions throughout the world, people remain concerned about crime. Majorities in 33 countries consider crime a very big problem, although again there are considerable variations – 93% of South Africans rate crime a very big problem, compared with only 22% of Chinese. Illegal drugs are considered a very big problem by majorities in 30 countries, including 61% of Americans. HIV/AIDS and disease is rated a major concern by majorities in 27 nations, including at least two-thirds of those surveyed in every African nation. Meanwhile, pollution fears are high in 26 countries. Even though worries about crime remain high, they have decreased in most of the 35 countries where trends are available from 2002. In France, 76% considered crime a very big problem five years ago, compared with 43% today. Concerns about crime have also dropped in much of Eastern Europe, with steep declines in Poland, Slovakia and Ukraine. 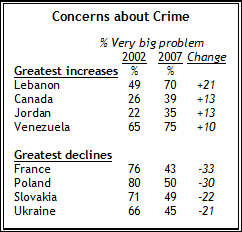 On the other hand, worries about crime have increased in a few countries, especially Lebanon; 49% of Lebanese rated crime a very big problem in 2002, but 70% consider it a major problem today. To further explore perceptions of crime, The Global Attitudes survey also asked respondents whether there is any area within a kilometer of their home where they would be afraid to walk alone at night (in the U.S. respondents were asked about an area within a mile of their home). Results show that fears about personal safety are highest in Latin America. In all seven regional countries surveyed, at least 50% say they would be afraid to walk near their homes at night, and particularly large majorities express this fear in Venezuela (84%) and Bolivia (71%). But concerns about crime are also high in Africa, especially South Africa, Kenya, and Ivory Coast. In Tanzania and Mali concerns are less widespread – only about one-in-three say they would fear walking in an area within a kilometer of their home. In the Middle East, there is no nation where a majority worries about walking near their home at night, although 44% of Palestinians express this fear. Similarly, in Western Europe, Eastern Europe, and Asia there is no public with majority saying they worry about their personal safety within a kilometer of their home, although in many countries significant minorities do voice these concerns. In most countries, women are considerably more worried than men about walking at night near their homes. In the United States, women (42%) are more than twice as likely as men (18%) to say there is an area within one mile of their home where they would not feel safe at night. While majorities in most countries continue to believe corruption among their country’s political leaders is a very big problem, these concerns also have declined in most countries. The percentage saying corruption among the political elite is a very big concern has dropped significantly in 25 of 35 countries, and in many the drop has been steep. Eight-in-ten Turks (79%) said corrupt political leaders constituted a very big problem in 2002, but today just 37% believe this. In Japan, South Korea, and Kenya the number naming corruption a very big problem has plummeted more than 20 percentage points. Major declines have also taken place in Bangladesh and Argentina, although worries about political corruption have hardly gone away in these two countries; roughly three-fourths of the public in each country says it is a very big problem. 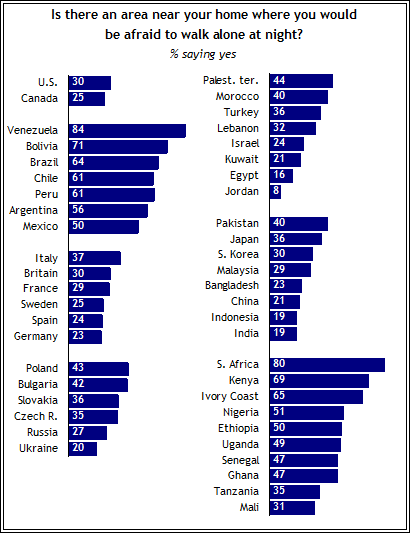 To learn more about respondents’ personal experiences with corruption, in developing countries Pew asked how often in the past year respondents have had to do a favor, give a gift, or pay a bribe to a government official in order to get services or a document that the government is supposed to provide. Significant minorities in countries such as Ivory Coast, Nigeria, Mali, Uganda, India, and Mexico say that, in the past year, they have had to provide such favors to obtain government services. However, in no country does a majority report that they have done this very or somewhat often. During the last five years the HIV/AIDS pandemic has continued throughout much of Africa, and other health threats such as the bird flu have garnered international attention, yet the level of concern about these health challenges is down from 2002 in most countries for which comparative data are available. The number of people saying the spread of HIV/AIDS and other infectious diseases is a very big problem has declined significantly in 25 of 35 countries. Sharp drops have occurred in China and Mexico, as well as in Kenya and Ghana, although it is important to note that in the latter two, and throughout the rest of Africa, concern about HIV/AIDS remains very high. Meanwhile, Jordanians (+17) and Bangladeshis (+15) have become considerably more worried about the spread of HIV/AIDS and other infectious diseases. Worries about terrorism also have declined in many countries since our 2002 poll, conducted just months after the Sept. 11 attacks. In 24 countries, significantly fewer people now rate terrorism a very big problem for their country. This pattern is evident in the United States; in 2002, 50% named terrorism as a very big concern, compared with 44% today. But the biggest decline has taken place in Nigeria – five years ago, two-thirds called terrorist attacks a very big problem, while only 40% do so now. And while still high, fears about terrorism have decreased substantially in India, a country that experienced a major terrorist attack as recently as July 2006, when several simultaneous bombings took place on the Mumbai train system. Over the last five years there has been considerable debate in Western nations about immigration. In Western Europe, there have been numerous controversies over immigration from North Africa and the Middle East, and ongoing debates about how to best assimilate Europe’s growing Muslim minorities. In the United States, immigration has continually been the cause of heated public debates, especially over what the U.S. should do regarding its large and growing population of illegal immigrants from Mexico and other countries. Despite the spotlight on immigration, however, there has been little change in Western opinions about how serious a problem this issue presents. The biggest change has taken place in Italy, which at 64%, has the highest level of concern about immigration in the 47 nations surveyed. Meanwhile, worries about this issue have actually decreased in France, the scene of rioting in the fall of 2005 in the suburbs outside Paris and many other largely immigrant communities throughout the country. The percentage of Americans who consider immigration a very big problem is virtually unchanged since 2002 (37% then, 39% today). Democrats (33%) are less concerned about immigration than are Republicans (45%) or independents (43%). Most publics say their governments and leaders are having a positive influence on their country. Majorities in 31 countries think their national government is having a good impact, while most in 32 countries say their president, prime minister, or head of state is having a good influence. The government of Malaysia fares the best – 92% say it is having a good influence. The governments of China, Bangladesh, Tanzania, and Kuwait are also highly regarded. At the other end of the spectrum, the Egyptian and Israeli governments overwhelmingly receive negative reviews. Since 2002, several publics have developed a much more positive view of their governments. Six-in-ten Turks (61%) currently have a favorable view, up from a meager 7% five years ago. An almost identical shift has occurred in Argentina (8% in 2002, 61% now). And in Lebanon, which has seen tremendous upheaval over the last five years – the assassination of a former prime minister, the end of Syrian occupation, the Cedar Revolution, an Israeli invasion, street protests by Hezbollah, violence in Palestinian refugee camps – the government is much more popular now than in 2002 (25% in 2002, 61% now). In several countries, including the United States and Canada, people tend to hold more positive views of their country’s military than of its leader. Americans (77% military good influence; 39% leader good) and Canadians (72% military; 56% leader) are considerably more likely to have a positive view of their countries’ armed forces. This pattern does not hold true in Latin America, where many countries experienced military coups during the 1970s and 1980s. Five of the Latin American countries included on the survey see their nation’s leader more positively than their armed forces. The gap is particularly stark in Argentina (67% leader good; 24% military good). Overall, majorities in 38 countries say the military is having a positive impact on their country. In Senegal, Bangladesh, India, Lebanon, Jordan, Malaysia, Tanzania, and Turkey more than 80% praise the military’s influence. There are, however, places where the military is less popular. While support for the armed forces is lowest in Argentina, it is also relatively low in neighboring Brazil (46%), as well as Sweden (42%) and Ethiopia (41%). 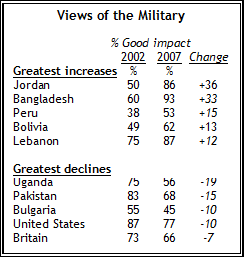 Views of the military have grown much more positive over the last five years in Jordan and Bangladesh, as well as Peru, Bolivia, and Lebanon. Opinions have grown slightly more negative, however in Uganda, Pakistan, and Bulgaria, in addition to the United States and Great Britain, where attitudes towards the Iraq war have soured in recent years. Nonetheless, both Americans and the British maintain overwhelmingly positive views of their armed forces (77% of Americans, 66% of British). 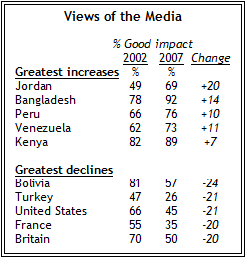 Overall, the media is seen as having a positive impact in 39 countries. However, there have been notable changes in many countries since 2002. Jordan, Bangladesh, and Peru all show substantial improvements in views of the media, while, media organizations have lost ground among Americans and the British. Europeans offer mixed reviews of the role that religious leaders play in their societies. In relatively secular Western Europe, majorities in Great Britain, Spain and Sweden believe religious leaders are a negative influence, while the French and Italians are roughly divided on this question, and Germans on balance see religious leaders in a favorable light. In Eastern Europe, Russians and Ukrainians tend to see religious leaders playing a constructive role, while Czechs and Bulgarians are less positive. Elsewhere, in most countries majorities hold favorable views of their country’s religious leaders – majorities in 33 nations say religious leaders are having a positive effect on their countries. Still, there are regional variations. Throughout Africa, large majorities suggest religious leaders are helping their countries, and in the Muslim nations of the Middle East and Asia they are also viewed positively. In Turkey, often considered one of the world’s most secular Muslim countries, people are much more likely to say religious leaders are having a positive impact today (61%) than they were five years ago (32%). A similar shift has taken place in Jordan (47% in 2002, 69% now). However, in some countries, opinions are divided. Israelis and Indians are roughly split over the impact of religious leaders, and in Japan few see them playing a positive role. In the United States, about six-in-ten see religious leaders in a positive light. Republicans (70%) are more inclined to do so than Democrats (58%) or independents (54%). Publics included on the survey generally show few fears of multinational corporations. In 33 nations, majorities think large companies from other countries are having a good impact. Support for foreign investment is especially strong throughout Africa. The only exception is Tanzania, where fewer than half (45%) believe that foreign companies are having a positive impact. In Asia, the Middle East, Eastern Europe, and Latin America, there also is broad support for foreign investment, although there are a few publics with serious reservations, including Argentina, Bolivia, the Palestinian territories, and Jordan, Russia and Ukraine. Opinions are more divided in Western Europe, Canada, and the U.S. Narrow majorities in Spain and Sweden think foreign companies are having a favorable influence, while most in France and Italy disagree. Americans are evenly divided on this issue – 45% believe foreign firms are helping the country and 45% think they are having a negative impact. Most publics tend to believe immigrants are having a bad effect on their countries. Majorities in only 12 countries say immigrants are making their countries better. Americans are slightly more likely to say immigration is good (50%) for the country than bad, while neighboring Canada (73% good) gives immigrants the most positive assessments on the survey. Swedes have positive views of immigrants, but in much of Western Europe opinions are mixed. And Italians overwhelmingly say immigrants have a bad impact on the country. Meanwhile, throughout Eastern Europe immigrants are viewed negatively. The sharpest drop in positive attitudes toward immigration on the survey occurs in Bulgaria, where the number of people who see immigration as a good thing has been cut in half in the past five years (42% in 2002, 21% now). In other regions, there is considerable variation among countries. In Asia, Indians are generally approving of immigration, while in Japan views are mostly negative. Similarly, in Africa, the Senegalese believe immigrants are having a positive impact, while South Africans tend to see immigration negatively affecting their country. In developing nations, we asked respondents about the impact of specific non-governmental organizations (NGOs) in their countries. In 35 of 36 countries, sizeable majorities state that these organizations are having a positive influence. The only exception is Pakistan, where 36% have a positive view, 29% a negative view, and 35% are unable to offer an opinion.